Die Arbeit für eine lebendige kulturelle Gemeinschaft trotz aller Widernisse der politischen Realität. Unlike Other Springs, which opened at the Birzeit University Museum on 19 March 2016, sheds light on the historical depth of the University’s art collection and its connection to the prevailing political and institutional project in the establishment of the Palestinian “State”. The experience of this exhibition unveils several accumulations of hard work and dedication of a cultural community where historically many individuals strived to contribute to the creation of a vivid cultural experience away from setbacks of the political reality. activated at that time an exposure to the arts and art production among the students, who produced several outstanding art exhibitions. More importantly it was the initiation of that energetic, creative environment on campus that triggered a general interest in the arts. In 1994, Vera was assigned to head a committee responsible for receiving the first major works of art to the University. Six monumental minimalist paintings had been donated by renowned Swiss artist René Feurer, who in his conviction of the University’s pioneering academic, national and cultural role, donated those works. That was a momentous period which witnessed the beginnings of the University’s art collection. Feurer’s gift was followed by several other major contributions made by artists such as Marwan Qassab Bashi, Kamal Boullata, Samia Halaby, Vladimir Tamari, Etel Adnan, Maurice Pasternak and many others. It was also in the same period, that the Dr. Tawfiq Canaan collection of Palestinian amulets was bequeathed to the University by his family. This unique collection was started by Canaan as a young physician in 1905. That well documented collection became an added asset to the University’s collections being a new and rich resource on the tangible Palestinian cultural heritage. Drawing from that evolving interest in the arts at Birzeit, Al Qamariyah Gallery was established in 1999. It comprised a small room and an adjoining corridor in one of the University buildings. It became the first dedicated exhibition space on campus. Al Qamariyah hosted many exhibitions by prominent Palestinian artists such as Sliman Mansur, Tayseer Barakat and Nabil Anani. These exhibitions had a special significance at a time when exhibition halls were not available to students, not even to the public in general. This attention to art led the University to consecrate a larger space for the management and exhibition of its collections. 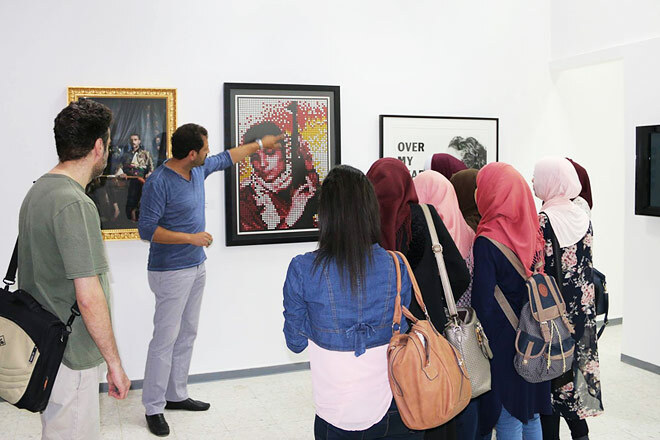 The Birzeit University Museum was thus established in 2005 and gradually became a landmark in the Palestinian cultural scene, where exhibitions, workshops and lectures took place. As a public Museum in the heart of an academic institution, the BZU Museum became a model for collective community engagement in the production and propagation of art and culture. Its practices focused on the evolving roles of contemporary museums and the consequent development of local concepts of art production and art collecting in the Palestinian context. After many successful endeavors, it became timely for the Museum to shed light on its distinctive experiences and on the importance of its art collection, which comprised by 2015 more than 250 important art works, all donated as gifts to the University. For that purpose, the BZU Museum invited artist Vera Tamari to curate an exhibition based on her personal history and experience with the art collection since the nineties, while at the same time revisiting and evaluating the collective experience which brought about the development of the Museum, from its inception back in 1994 until now. While preparing for Unlike Other Springs, Vera Tamari made a selection of earlier works from the collection, supplementing them with additional documents and interviews. The pioneering artists who initiated that trend of offering their art works as gifts to BZU were: René Feurer, Marwan Qassab Bashi, Kamal Boullata, Etel Adnan, Maurice Pasternak, Laila Shawa, Vladimir Tamari, Mona Bassili Sehnaoui, Rachid Koraïchi, Nasser Soumi, Samia Halabi, Sari Khouri, Ismail Shamout, Samira Badran, Mona Hatoum, Mona Saoudi, Vera Tamari, Mizuko Yakuwa, Jorge Shmeitzer, Guy Cobb and Louis Nakhleh. Furthermore, and in order to make the collection more representative and more comprehensive, the curator invited a new number of Palestinian artists to engage and participate in the exhibition by donating one of their works. To reaffirm their mutual societal role, all the 25 artists who had been approached, unhesitatingly agreed and welcomed the idea and all donated a representative work to the Museum collection. These artists included: Sliman Mansur, Suha Shoman, Nabil Anani, Tayseer Barakat, Emily Jacir, Rula Halawani, Husni Radwan, Taysir Batniji, Samir Salameh, Hani Zurob, Khaled Hourani, Jawad Al-Malhi, Jumana Manna, Raeda Saada, Sharif Waked, Ahmad Kanaan, Khalil Rabah, Inass Yasin, John Halaka, Tayseer Sharaf, Amer Shomali, Omar Yusef Ben Dina, Yazan Khalili and Bashir Makhoul. In addition, the Palestinian researcher and collector George Ama donated two unique works from his own collection: an oil painting by writer and artist Jabra Ibrahim Jabra and a landscape drawing by the pioneer artist Sophie Halaby. For the purpose of engaging the University community with the exhibition, Unlike Other Springs was accompanied by a number of educational activities and seminars. In opening discussions on the collections and their role in education and production of knowledge, a one day seminar “Phenomenon of Art Works Collection in Palestine” was held. It provided an important opportunity for many cultural actors to meet and discuss the meaning of museum work in Palestine. Participating as speakers in the seminar were Vera Tamari, George Al-Ama, Jack Persekian, Khalil Rabah and Lara Khalidi. It was moderated by Inass Yasin, BZU Museum Director. Wild Flowers in Palestine, the exhibition showed the watercolor paintings of artist Louis Nakhleh, who had also donated her works to the University. Along with those paintings, the intervention “The Digital Myth of Palestinian Flora” made by students from the Faculty of Architecture at Birzeit University was also exhibited, under the supervision of Dr. Yazeed Anani and Dr. Samar al-Nazer. Additionally, the video works in the BZU collection had a special platform. The “Video Art Festival Revisited” was curated by artist Emily Jacir. Back in 2002 Jacir collected from artists throughout the world, copies of valuable video art works as part of “The First International Video Art Festival” which she herself organized and donated to BZU. The weekly activities and schools' and universities' visits to the exhibition and the Museum in general will continue until 30 June 2016. This article is based on an interview held in April 2016 with Vera Tamari, Palestinian artist, art activist, founder of the Birzeit University Museum and curator of the current exhibition “Unlike Other Springs”. It unfolds the experience and role of the Museum as a pioneering exhibition space, in one of the foremost academic institutions in Palestine, and the context of the creation of that space within the recent surge of museum building. Künstlerin und Kuratorin. Derzeit Direktorin des Birzeit University Museum, Palästina. Die wechselnde Frauendarstellung in der palästinensischen Kunst, Ethnographic & Art Museum, Birzeit Universität.